HANDAL : Refrigerated air dryer is specifically designed for Asia Pacifice climates. The ensures ideal running temperature under high and low humidity environment. Our professional team with over 20 years of experience in refrigerated air dryers has developed the product by using high quality components to ensure customer satisfaction and products quality. 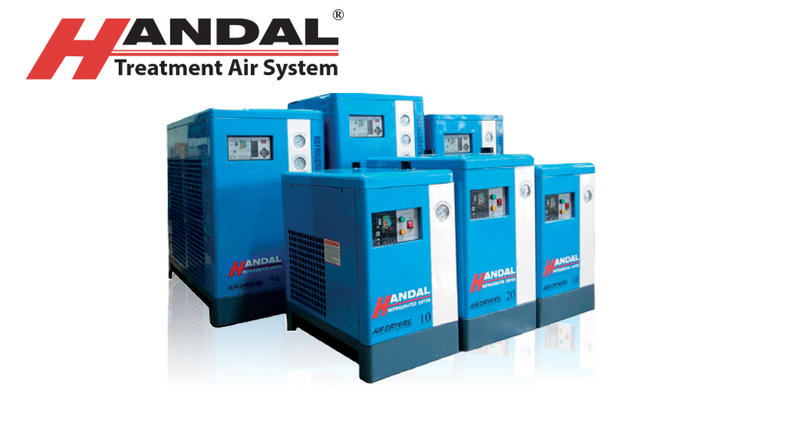 HANDAL : The process of pre-cooling air to air exchanger are as described ; First, by compressing a stream of air then cooling the compressed air to enable water separation and removing water from the stream of air to provide dry air. Next, by compressing the dry air stream and by cooling the compressed dry air stream, it enables the removal of contained remnant water. Furthermore, by expanding the cooled air stream in an expansion stage, which extracts work from the expanding stream, then passing the expanded air stream to a separator operation to remove water from the stream, therefore producting dry air passed to a component gas separation stage.